Via a partnership with Health Brand Group, Kate worked with University of California, San Francisco and their enrollment management partners to develop a powerful new story for UCSF's Master of Science in Healthcare Administration and Interprofessional Leadership (MS HAIL). With just one graduating class since its launch, the MS HAIL program had proven to itself and its new alumni that this powerful graduate program is unlike any other garden-variety healthcare administration degree in the nation. The challenge? To prove it to the marketplace. Attracting future cohorts of rising and recognized stars in the healthcare industry would require truly understanding how to tell the MS HAIL story. And strategic brand storytelling is what Silver Tree Communications does best. Across the span of several months, Kate led a high-touch research initiative through which students, alumni, staff and administrators shared their own personal stories about the MS HAIL program -- about who chooses this elite graduate program, how it impacts careers, and what the experience is truly like. At the conclusion of that research, Kate brought their collective stories to life by crafting one dynamic and truly differentiated story about the program. 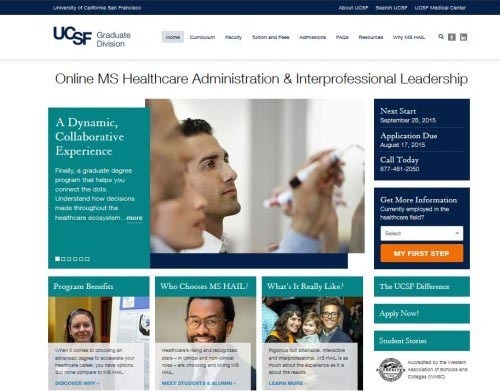 That story is driving marketing and admissions initiatives at UCSF and is currently being adapted to a redesigned admissions website for the MS HAIL program. UC San Francisco is the country's leading university dedicated exclusively to health, and is recognized nationally and internationally for its excellence in education and clinical care. All four UCSF professional schools, UCSF Medical Center, UCSF Benioff Children’s Hospital and virtually all UCSF graduate programs consistently rank among the best in the country, according to the latest surveys by US News & World Report. But even at the best universities in the world, launching a new graduate program and communicating its value to the healthcare professionals that will someday enroll is serious business and a challenging endeavor. Armed now with a very clear sense of what makes the MS HAIL program so impactful, and how to talk about that impact to the world, UCSF is poised for increased enrollments and improved marketing ROI.